Robin Merrill is a mother of two, and a freelance writer who can usually be found writing about criminal justice colleges and universities. If there were a soundtrack to my childhood, it would be called Johnny Cash: The Complete Collection. As a book-obsessed adult, when I noticed Daddy Loves His Little Girl by John Carter Cash, I couldn’t pass it by. This 32-page children’s picture book was published by Little Simon Inspirations (2010) and is illustrated by Marc Burckhardt. Of course, I don’t mean to suggest that John Carter Cash is only Johnny Cash’s son. He has also won five Grammy Awards, and has authored two other books: Anchored in Love – An Intimate Portrait of June Carter Cash and another children’s book, Momma Loves Her Little Son. 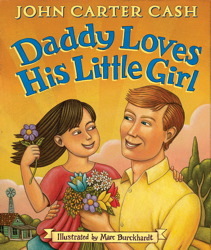 Daddy Loves His Little Girl is marketed toward an audience of 4-8 year olds. My 3-year-old daughter has a magical relationship with her father, who does an awesome job of reading to her. She loves this book, so I would recommend it is also appropriate for 2 and 3 year olds. The story is written in metered, rhyming quatrains, so it’s rhythmic to read, and my daughter can work at predicting what words and sounds will finish my sentences, a feature we both enjoy. with arms spread open wide. and holds it deep inside. The narrative continues to be evocative, and the first few times through it, I got teary-eyed. (Don’t worry, my daughter is used to this, so she wasn’t alarmed.) The narrative goes on to emphasize the father’s love, explaining that he will express this love by nurturing his little girl’s imagination. Together, father and child go on a magical adventure, the highlight of which might be the little girl leading a thousand-drummer band. The book ends, as most of my favorites do, with a calming good night message. It has quickly become one of my favorites in our family’s collection, and I am sure I will be reading it another several hundred times, so I’m thankful I won’t tire of it.